Are you looking for a true escape from the everyday? 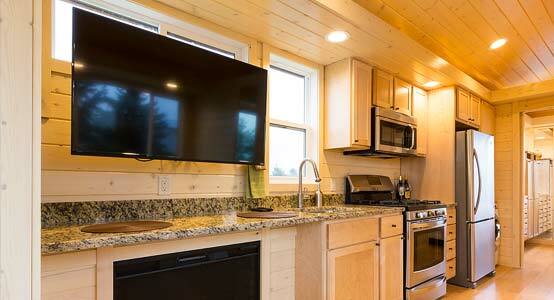 Are you looking for a Northwoods experience with a touch of luxury? 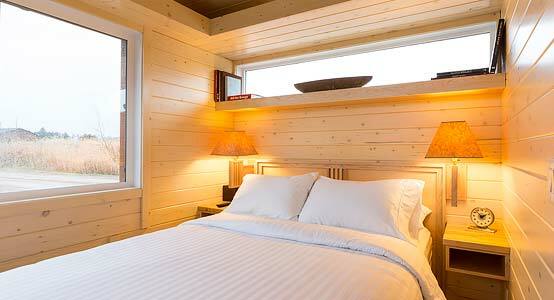 Our newest cabin is a gorgeous, stand-alone cottage with a panoramic view of the lake. This cabin, built by Escape Homes and designed by the acclaimed SALA Architects, is actually part of the tiny home movement – and it makes for an ideal vacation retreat. Impeccably designed to provide a distinctive and graceful style, it maximizes every inch of living space (400 S.F.) and is built around natural beauty – both inside and out. 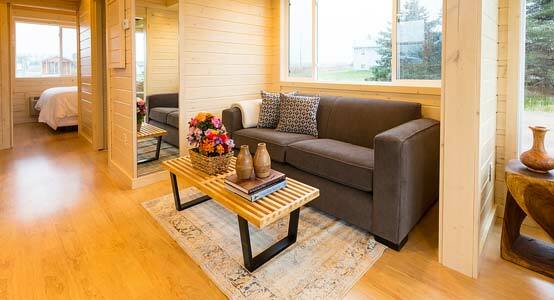 This cozy cabin is ideally suited for couples or smaller groups that are looking for the next level of amenities. 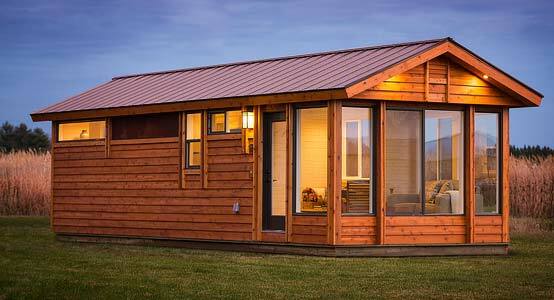 It offers a single bedroom with queen bed, extensive cabinetry and a flat screen TV. In the Living Room / Sunroom, there is a pull-out couch for additional sleeping space, wall-to-wall windows (with blinds), and a fireplace for tranquil evenings overlooking the lake. While the footprint may be small, the imprint most certainly is not. Complete with vaulted ceilings, white-washed pine throughout, hardwood floors, and lots of windows ideally placed to appreciate the lake view, this cabin brings the outside in. The full-service kitchen includes stainless steel appliances, granite countertops, and efficient workspace so you can prepare even the most elaborate meals in your peaceful getaway. The bathroom features a granite vanity and full-sized tub shower unit for ultimate relaxation. Overall, this cabin offers the finest style, a refined escape into nature, and a luxurious Northwoods retreat.